Dismissed! This week Trey was able to secure a dismissal for a client charged with possession of marijuana in Greensville, Virginia. This week, Trey secured a reduction from reckless driving (88/70 mph) to defective equipment. 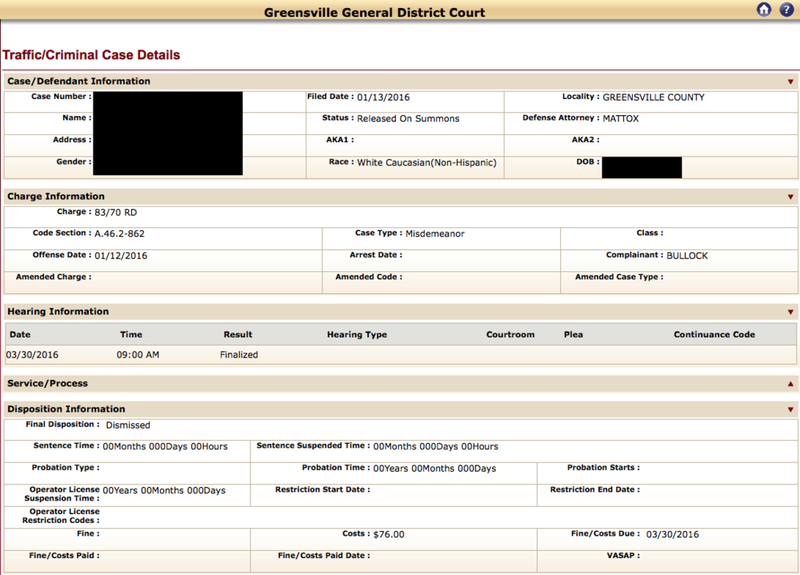 In Greensville, Trey represented a client charged with reckless driving for traveling 87 mph in a 70 mph zone. This particular client was a registered nurse and could not afford a class 1 misdemeanor conviction. Trey advised our client to have her speedometer calibrated. By doing so, Trey was able to achieve a reduction to defective speedometer. This saved our client from the misdemeanor conviction, additional points on her license, and penalties with insurance. This individual was charged with reckless driving for traveling 86 mph in a 70 mph zone. Trey was able to obtain a reduction to a non-moving violation called defective equipment without the requirement of driving school. This individual was charged with reckless driving in Greensville, Virginia for traveling 88 mph on a 70 mph zone. Trey successfully secure a reduction to a non-moving violation called defective equipment, upon completion of a aggressive driving school. This avoided the misdemeanor conviction and prevented any points from going onto our clients driving record. In Greensville County, Trey represented a client charged with reckless driving, a class 1 misdemeanor, for traveling 77 mph in a 55 mph zone. Trey was able to achieve a reduction to a non-moving violation, defective equipment. This prevented any points from going on our clients driving record and avoided the misdemeanor conviction. Earlier this week, Trey represented a client, in Greensville, Virginia, charged with reckless driving for traveling 21 mph over the speed limit. Trey was able to obtain a reduction to defective equipment. This is a non-moving violation that did not add any points to her driving record. She did not even have to do driving school! This week, Trey represented a client charged with reckless driving in Greensville, Virginia, for traveling 84 mph in a 70 mph zone. A reckless driving conviction adds 6 points to a Virginia driving record for 11 years. Trey however, was able to secure a dismissal avoiding any points and our client did not even have to do driving school. Not only that, but she did not even have to pay court costs or fines. Yesterday, Trey represented a client charged with reckless driving for traveling 87 mph in a 70 mph zone. Trey was able to obtain a reduction to a non-moving violation called defective equipment. This helped maintain our clients clean driving record and prevent any penalties with insurance. Yesterday, our firm represented a client in Greensville, Virginia charged with reckless driving (a class 1 misdemeanor) for traveling 27 mph over the speed limit. With a favorable calibration and a sincere letter of apology, Trey was able to obtain a reduction to speeding (19 over) and avoid the expected community service and aggressive driving school. In Greensville, Virginia, Trey represented a client charged with reckless driving, a class 1 misdemeanor, for traveling 83 mph in a 70 mph zone. Trey advised our client to do driving school before court to show the court she was being proactive and was willing to do the work to rectify the situation. This allowed Trey to successfully secure a complete dismissal. Futhermore, our client was only asked to pay $76.00 in court costs! Recently, Trey represented a client charged with reckless driving for driving 81 mph in a 70 mph zone in Greensville, Virginia. Trey was able to obtain a reduction to defective equipment. This is a non-moving violation that prevented our client from having any points added to their driving record or any penalties with insurance. Trey was also able to have the fine and court costs reduced from $206 to $96. This week Trey was able to secure a dismissal of our clients possession of marijuana charge with out the lengthy and expensive first offenders program. This saved our client from having to do a series of random drug screening and substance abuse courses. Not only that but our client did not have to pay any court costs or fines and he was able to keep his license. Recently, Trey represented a client in Greenville, Virginia who was charged with reckless driving-failure to maintain control when her car hydroplaned into a ditch. Trey was able to achieve an outcome resulting in a dismissal of the charge. Last week, Trey was able to secure a complete dismissal of our client's reckless driving (83/70) charge. Not only that, but he was able to avoid any court costs or fines! Last week, Trey was able to successfully achieve a reduction from reckless driving 88 miles per hour in a 70 mile per hour zone to defective equipment. The client is currently in the military with a top security clearance and a conviction of the could have cost this client their job. Last week in Greensville General District Court, Trey successfully achieved a dismissal for a client that was charged with reckless driving by speed (82/70.) A conviction would have added points on the client's driving record and a class 1 misdemeanor on their criminal record. Trey was able to have the charge dismissed with only court costs. Getting a reckless driving case dismissed is very difficult in Greensville, VA and our client couldn't have been happier. As a current military member with a security clearance, a conviction of the misdemeanor charge would have possibly had him fired from his job in the military. Last week in Greensville General District Court, Trey was able to secure a reduction from reckless driving (86/70) to a non-moving violation, defective equipment. This kept any points from going on the client's driving record and avoided the class 1 misdemeanor from going on their criminal record. Last week, Trey represented a client charged with reckless driving (89/70.) Trey was able reach an outcome reducing the reckless driving charge down to a non-moving violation called failure to obey highway sign while sleeping. This did not carry any points onto his driving record and kept the misdemeanor charge off of his criminal record. This was very important to our client, as he required a security clearance for work. Recently, Trey was able to have a reckless driving-generally charge reduced to a non-moving violation called defective equipment. This reduced charge does not carry any points onto the client's driving record and will not affect her car insurance premiums. The client only had a small fine and court costs to pay, which was so important to her since she was retired and on a fixed income.